Trifles have a long history, with their first recorded mention dating back to the 16th Century. Most of us can remember home made trifles that would contain a little (or a lot!) of alcohol at Christmas. 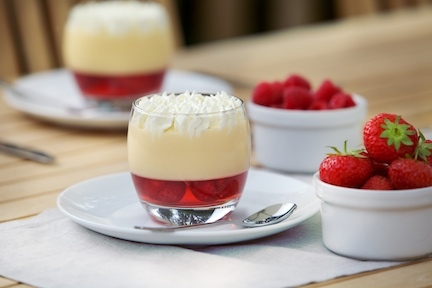 Withe their eye-catching contrasting layers of jelly, sponge, custard and cream, trifles are the biggest selling dessert category in the UK, and manufacturers are constantly adapting their recipes, process and technology in order to improve production efficiencies. This has been most evident in one of trifle’s key ingredients – trifle jelly! As a layered product, trifle jelly must not only deliver the softness and clarity targets of the brief but also be pump-able yet strong enough to support the next layer, which makes its development very specific. There is always something that can be done to improve the cost base of a product, at KaTech we seek to provide options for your business on both cost and quality. Our team at KaTech can advise you on how to create a great product for less.